The farm bill is complex package of legislation – like other authorizing bills, the bill’s primary focus is on policies and programs, but unlike many authorization bills, the farm bill also provides direct funding for many of the programs it authorizes. Farm bill programs, therefore, have two ways to receive funding: mandatory (or direct) funding through the farm bill, and annual funding through the appropriations process. Because mandatory funding provided by authorizing legislation is substantially larger than appropriated funds, which programs receive mandatory funding and how much is always a contentious issue in farm bill debates. 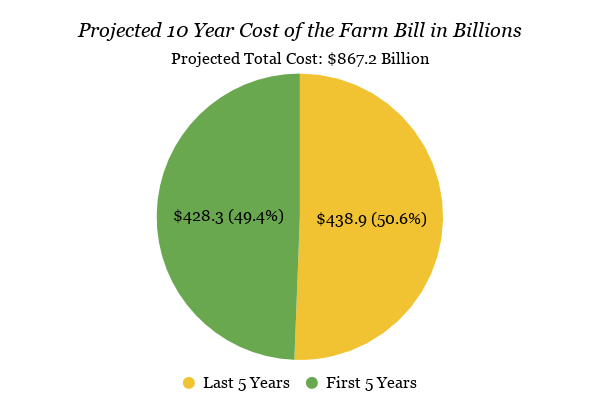 In this post, we provide a high-level overview of some key spending pieces included in the 2018 Farm Bill. The new bill is estimated to spend $428.3 billion over its 5-year lifespan, and $867.2 billion over the 10-year time frame by which all bills are measured per congressional budget rules. These final totals very closely match the budget “baseline” dollars (current spending projections, prior to the new bill becoming law, without any changes in policy or programs) with which the farm bill’s authors had to work. The new bill includes $1.8 billion in additional spending relative to baseline over the next 5 years, but more or less matches the baseline over the 10-year window. However, that does not mean that money does not shift within the bill and between titles of the bill. Closely adhering to the baseline dollar amounts only means that when considering farm bill funding as a whole and on a net basis, there is very modest change. Four titles of the 12-title farm bill receive the lion’s share when it comes to direct funding – nutrition programs (primarily the Supplemental Nutrition Assistance Program or SNAP), commodity programs, federal crop insurance, and conservation. The Nutrition Title is by far the largest, representing nearly 77 percent of all farm bill direct funding in the new bill. The “farm” part of the new farm bill represents 23 percent of the bill’s direct funding, including the commodity, crop insurance, and conservation titles, which is spread across a wide range of programs. Since the 2014 Farm Bill has been in effect, the commodity farm economy has been in a state of decline. Due to lower commodity prices than anticipated when the 2014 bill was signed, the projected cost ($44.5 billion over 10 years) illustrated above made in 2014 proved to be way off. Thus, the big increase shown graphically above between the two bills has less to do with any major changes in the new 2018 bill, and more to do with commodity prices being lower than projected back in 2014. Because U.S. commodity support costs are counter-cyclical, costs increased as the commodity economy declined. A small portion of the increase stems from policy changes made during 2018, but the bulk comes from changes in the baseline. By the same token, lower farm gate prices have resulted in lower premium subsidies for federal revenue insurance since projected revenues are factored into premiums. Hence, just as the cost of commodity programs rose, the cost of the federal crop insurance program has gone down compared to estimates made following the 2014 Farm Bill. The combined net cost of the two sets of safety net subsidies did rise, however, by over $8 billion. The Conservation Title took a $6 billion hit to overall funding in the 2014 Farm Bill; funding levels in the new bill retained that $6 billion cut but then neither increased nor decreased total funding from that new lower baseline. The small increase in projected costs between the two bills derived from baseline assumption changes and not from policy changes. *The Nutrition Title is level funded overall, but certain savings within the title from SNAP help fund the new, increased permanent funding for the Food Insecurity Incentives Program (FINI). The Rural Development Title decrease is all from one provision (cushion of credit) explained in the text below. Total new funding for research and extension grants is actually a bit higher than shown here because the Beginning Farmer and Rancher Development Program, administered by the National Institute for Food and Agriculture, has been moved from the Research Title to the Miscellaneous Title. The biggest share of the increase in the Horticulture Title and Miscellaneous Title is the LAMP and FOTO program, respectively. A new annual option that allows commodity farmers to choose between the Agricultural Risk Coverage (ARC) and Price Loss Coverage (PLC). The vast majority of farmers are projected to take the PLC option, at least in the near term, and that will result in increased spending. An escalator clause that will make PLC payments more likely even if prices recover. The most extensive set of increases to commodity loan rates since 2002. A double dipping provision to allow dairy farmers to participate in the dairy program at the same time that they also participate in subsidized livestock gross margin insurance on the same milk production. About 40 percent of the net increase in commodity program spending is offset by an increase in crop insurance fees for catastrophic coverage and other small changes to the Crop Insurance Title. A provision removing commodity program benefits from farms that 100 percent converted cropland to grass-based agriculture also provides a partial offset, though partial compensation for these operations is actually moved to the Conservation Title, with the addition of an option for payment within the Conservation Stewardship Program (CSP). Stitching together a new farm bill under a “no new funding” constraint inevitably requires Congress to fund emerging priorities through creative trimming or eliminating of existing programs. The title-by-title chart above illustrates which of the other more minor titles of the farm bill received new or increased funding, as well as where the major offsets came from. Titles that received new funding included: Trade, Agricultural Research, Horticulture (primarily local and regional food and value added agriculture programs), and Miscellaneous (primarily beginning and social disadvantaged farmer programs, plus the new animal disease vaccine bank). The bulk of the offset for new funding came from a change to a provision known as the “cushion of credit” for rural electric utilities, which shows up in the chart as part of the Rural Development Title. An anachronistic provision of law locked in a 5 percent interest rate for a rural electric escrow account, even while interest rates plummeted for the past ten years to much lower levels. This created a windfall, resulting in the originally small account mushrooming to over $7 billion in value. The new farm bill keeps the windfall interest rate at 5 percent for two years, but reduces it to 4 percent in 2021 and then to the one-year Treasury rate thereafter. The funding increase for the Regional Conservation Partnership Program (RCPP) shown in the chart above is a bit misleading. Total funding available for RCPP is actually reduced, but the funding mechanism has been changed. Under the 2014 Farm Bill, the primary funding was money transferred from EQIP, CSP, and ACEP to RCPP. Under the new bill, no money is transferred and instead the program will rely entirely on its own funding line. The Public Law 566 or Small Watershed Dam Rehabilitation Program is for the first time ever being granted permanent mandatory funding status under the new bill. The “Other” category include a variety of small programs including feral hog control payments and payments to farmers to allow hunting on their property. Conservation Title spending remained level in the new farm bill on a net basis. Although the National Sustainable Agriculture Coalition (NSAC) and other conservation advocates had pushed for increased funding, flat funding was at least a better outcome than cuts – as we saw to the tune of $4 billion in the 2014 Farm Bill (or $6 billion when accounting for automatic sequestration cuts). However, in order to increase spending on conservation easements (e.g., wetland restoration easements and farmland protection easements), provide new permanent funding for small watershed dam rehabilitation, and fund a variety of small programs (e.g., feral swine control), the bill significantly reduced funding for working lands conservation. While NSAC supports the case to increase funding for many of these conservation programs, especially easement funding, we strongly oppose Congress’ decision not to restore the $6 billion cut from the title by the last farm bill. By failing to restore this massive funding cut, the 2018 Farm Bill essentially robs Peter to pay Paul. With even less funding available for working lands conservation in the future, when Congress writes the next farm bill it will face tough constraints indeed to pay for much-needed water quality and quantity improvements and soil health efforts to address climate change mitigation and adaptation. The farm bill’s two primary working lands conservation programs are the Conservation Stewardship Program (CSP) and the Environmental Quality Incentives Program (EQIP). Despite the fact that helping our farmers to sustain their operations and natural resources through conservation practices should be a bipartisan no-brainer, working lands conservation was at the center of several 2018 Farm Bill fights. The dispute over working lands conservation started early on, with the House and the Senate bills leagues apart in their language and goals for conservation. The House bill proposed to completely eliminate CSP, while the Senate bill retained both CSP and EQIP as standalone programs serving distinct purposes. The final farm bill retains both EQIP and CSP as standalone programs, but as illustrated in the chart above, over time it takes funding from CSP and shifts it to EQIP and other Conservation Title programs. NSAC fought hard to protect CSP’s unique identity as well as its funding, and while we were delighted by the policy improvements included in the new bill, we were very disappointed to see Congress’ lack of funding support for the only conservation program that takes a performance-based and comprehensive approach to stewardship. The chart above reflects funding authorized for new CSP contracts, as well as funding available to pay out existing five-year contracts that are already in place. As one can see, the new farm bill will result in a steep decline in total funding for CSP as currently enrolled contracts expire. Under the 2014 Farm Bill, funding was equally distributed between EQIP and CSP. The 2018 Farm Bill, conversely, tilts funding way from CSP and toward EQIP. By the end of the bill’s five years (once existing CSP contracts expire) there will be a nearly $1 billion per year difference between total funding available for EQIP vs. CSP. The chart above also reflects the total amount of funding available for EQIP and CSP over the ten-year funding window of the new farm bill. As illustrated by comparing total funding for these two programs under the new bill (gray line) to current baseline estimate under the 2014 Farm Bill (yellow line), the long-term loss in funding will be roughly $500 million. The difference between what is authorized under this farm bill and what had been available under previous baseline, for the “out years” of the farm bill (2024 – 2028) is significant. The ten-year total of what Congress will have available in baseline funds for working lands when they go into the next farm bill will be more than $5 billion less than what would have been available if there were no changes made in the 2018 bill. The overwhelming environmental need and farmer demand for conservation assistance means that advocates like NSAC will have an uphill battle to restore the lost funding in the next farm bill. The new bill combines a variety of trade promotion programs under one umbrella and increases funding by $470 million over 10 years for a grand total of $2.55 billion over the coming decade. In the process it makes all the trade promotion programs permanent. The other programs that will now have permanent mandatory funding status are the Food Insecurity Nutrition Incentives (FINI), Organic Agriculture Research and Extension Initiative (OREI), Local Agriculture Market Program (LAMP), and Farming Opportunities Training and Outreach (FOTO). One of the biggest victories for NSAC and our allies and champions in the 2018 Farm Bill was the provision of mandatory, permanent funding to several “tiny but mighty” farm bill programs. These programs were formerly known as “orphan” or “stranded” programs because their funding would sunset and have to be renewed every farm bill cycle in order for them to continue operating. Food Insecurity Nutrition Incentives (FINI), which was recently renamed the Gus Schumacher Nutrition Incentives Program (GSNIP) for our dear friend, who championed so many farmer-to-consumer causes in his lifetime. Some of these tiny but mighty programs were combined in order to create larger, more robust programs with mandatory funding: BFRDP and Section 2501 were combined into the Farming Opportunities Training and Outreach (FOTO) program; FMLFPP and VAPG were combined into the Local Agriculture Market Program (LAMP). The un-orphaning of these tiny but mighty programs is a huge victory for the sustainable agriculture movement. Finally, farmers of color, new and beginning farmers, farmers serving value added or local markets, and organic farmers have a permanent seat at the farm bill table. Permanent, mandatory funding will ensure that these programs – and those they support – have security and something to build upon in the future. The 2018 Farm Bill, like most of its recent predecessors, is not entirely devoid of orphaned programs; many are illustrated in the chart above. Orphaned programs of particular interest to NSAC and the sustainable agriculture community include the Conservation Reserve Program (CRP) Transition Incentives Program (TIP), National Organic Certification Cost Share Program, and the Organic Production and Market Data Initiative (ODI). CRP-TIP provides opportunities for new farmers to lease or buy land that is coming out of CRP contracts. This program not only helps connect beginning farmers to scarce farmland, it also ensures that the land is well stewarded even after it returns to production. The National Organic Certification Cost Share Program provides assistance to help offset annual certification costs under the National Organic Program. Lastly, ODI boosts funding available to USDA to develop and make available basic production and marketing information about the organic agriculture sector. Above we looked at programs that have just acquired permanent mandatory funding in the new bill. We also looked at some of the programs that receive mandatory, but not permanent funding. There is another category, programs that already have permanent mandatory funding, programs like the Specialty Crop Block Grant program and the Rural Energy for America Program. In this final chart, we have tallied the budget authority, by title, of all three of these categories, to help show where the farm bill is investing money within that tiny overall sliver that we labeled “everything else” in the opening pie charts at the top of this blog. As discussed above, the numbers are an important part of the 2018 Farm Bill, but of course the numbers alone do not tell the full story. As we have previously reported through our drill down blog series, the policy reforms included in the bill will have major implications for agriculture and food systems in the years ahead. With the farm bill now signed into law, NSAC will turn our attention to implementation of the bill, working to protect and enhance the wins that we secured in statute, ensuring the details of how these changes are rolled out and interpreted by the USDA ensure critical benefits for sustainable agriculture over the next five years and beyond.